After a day of speculation, Apple finally confirmed that it will be releasing a special-edition iPhone 8 and 8 Plus in a colour that has both striking appeal and a noble cause. The aesthetics include a red glass enclosure, an aluminium band and a black front. There will be no price differences with the current iPhone 8 line-up which start at Dh2,991.50. A portion of all proceeds from PRODUCT(RED) sales goes directly to Global Fund HIV/AIDS grants, which provide testing, counselling, treatment and prevention programmes. MacRumors had earlier reported on Sunday that Apple was to indeed launch the special-edition devices, citing an internal memo obtained by the website and distributed to employees of Virgin Mobile. It had, however, noted "as early as tomorrow [Monday]. And Bloomberg tech reporter Mark Gurman corroborated this report, replying to a MacRumors tweet regarding the news: "Indeed should be this week. Nice scoop." 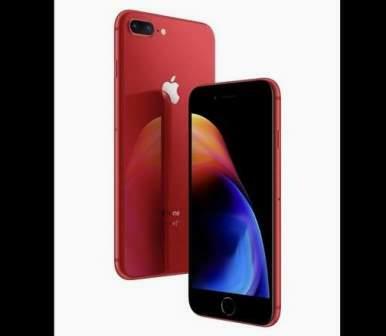 The release of the PRODUCT(RED) devices also revived a recent rumour that Apple may release a gold iPhone X.
MacRumors, quoting Japanese blog Mac Otakara, reported on March 26 that Apple could release a new gold-coloured iPhone X, though an actual date remains unknown. The iPhone X only comes in silver and space grey. If a gold one does come up, it would be similar to those seen in iPhones before it. Forbes reported on Sunday that Apple "deliberately curtailed colour options up to this point", and that talk of a gold iPhone X "remains strong so it may be that is Apple's preferred route in time". The AirPower wireless charging mat is also rumoured to be released this week.